(Nanowerk News) Imitating photosynthesis in plants? If we were to accomplish this, mankind would have a little less to worry about. Chemists from the University of Würzburg have now made progress on the road to achieving artificial photosynthesis. The structure that has been developed in the university's Organic Chemistry laboratory is fascinatingly complex: thousands of similar molecules are packed together to create a capsule that is filled with molecules of a different kind. The diameter of one capsule is a mere 20 to 50 nanometers, which is one ten-thousandth of a pinhead. Structures that are so elaborate are far from the ordinary in chemistry. So, it is hardly surprising that these Würzburg nanocapsules appear on the front page of the November issue of the journal Nature Chemistry ("Vesicular perylene dye nanocapsules as supramolecular fluorescent pH sensor systems"). What is more, they can also do something that has not been described before for chemically synthesized molecules. Nanocapsules possess a property that is important in photosynthesis in plants: the molecules inside the capsule absorb light energy and emit some of this again in the form of fluorescent light. The rest of it, however, is transmitted by energy transfer to the capsule molecules, which then also cast fluorescent light. As far as photosynthesis is concerned nothing different happens, to put it simply: molecules harness energy from sunlight and transmit it to other molecules in a complex process, at the end of which the energy is bound chemically. The sun's power then sits in valuable carbohydrates that plants, animals, and people use to generate the energy they need to live. In principle, therefore, the nanocapsules should make suitable components for an artificial photosynthesis contraption. "They would even use the light far more efficiently than plants because their synthetic bilayer membranes would be composed entirely of photoactive material," says Professor Frank Würthner. Why conduct research into artificial photosynthesis? In photosynthesis, plants consume the "climate killer" that is carbon dioxide. In view of global warming, many scientists see artificial photosynthesis as a possible way of reducing the volume of the greenhouse gas carbon dioxide in the atmosphere. In addition, this process would also create valuable raw materials: sugar, starch, and the gas methane. The Würzburg nanocapsules are comprised of a unique material. This was developed in Frank Würthner's working group on the basis of so-called amphiphilic perylene bisimides. If the base material, which can be isolated as a powder, is placed in water, its molecules automatically form so-called vesicles, though these are not stable at that point. 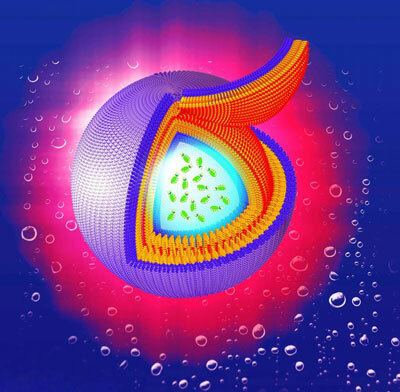 It is only through photopolymerization with light that they become robust nanocapsules that are stable in an aqueous solution - regardless of its pH value. It was the visiting scientist from China, Dr. Xin Zhang, who managed to fill the nanocapsules with other photoactive molecules. A fellow of the Humboldt Foundation, he is currently a member of Professor Würthner's working group. Zhang smuggled bispyrene molecules into the nanocapsules. The special thing about these molecules is that they change their shape to suit their environment. Where the pH value is low, in other words in an acidic environment, they assume an elongated form. If they are then excited with UV light, they emit blue fluorescent light. If the pH value rises, the molecules fold. In this shape they emit green fluorescent light. In this state the bispyrenes excite the capsule shell energetically, which reacts to this with red fluorescence. Blue, green, and red. If the three primary colors overlap, this produces white - as with a color television. It is the same with the nanocapsules: with a pH value of 9, in other words just right of neutral, they emit white fluorescent light - "a so far unique effect in the field of chemical sensing, which might be groundbreaking for the design of fluorescence probes for life sciences," explains Professor Würthner. The Würzburg chemists have access to an extremely sensitive nanoprobe: the pH value of an aqueous solution can be determined with nanoscale spatial resolution over the wavelength of the fluorescent light emitted by the nanocapsules. This means that nanocapsules are not just an option for artificial photosynthesis, they can also be used for diagnostic applications. For example, they could be equipped with special surface structures that purposefully dock to tumor cells and then make these visible by means of fluorescence. Both possible applications are the subject of further research by Frank Würthner and his team. The work described here was funded by the German Research Foundation (DFG).